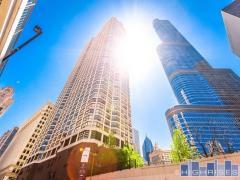 The Sterling is an affordable and popular high-rise tower in the center of the River North neighborhood. Enjoy the long list of amenities here including tennis courts, outdoor pool, fitness center, sundeck, outdoor grilling area and community room. Have any comments or questions about The Sterling? Ask your question and/or share your thoughts about this Building.